Paul Heckingbottom admits he is still frustrated that the actions of one fan prevented his Hibs players from taking credit for securing a point against Rangers. A 1-1 Easter Road draw last Friday was overshadowed by a Hibs supporter leaping onto the touchline to confront Rangers captain James Tavernier. A 21-year-old man later admitted breaching the peace in court. Heckingbottom said: “It ruined the evening for me, the players, the rest of the people at the club and I’m sure the majority of the fans. “Everyone was asking me, not just press, about that incident because it was all over the news and the sports news. “It’s frustrating because the players never got the credit they deserved, and the club’s getting tarnished in a way that’s not a true representation of all the fans that are attending. 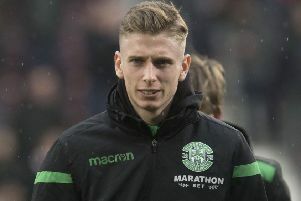 Hibs and their supporters have the chance to make headlines for the right reasons when they host Motherwell on Saturday in a game which could prove pivotal in the race for the Ladbrokes Premiership top six. Hibs are two points ahead of their visitors in sixth spot and Heckingbottom expects Motherwell to throw everything at his side. “Everyone’s found them difficult to beat, they are on a fantastic run of form and they are chasing, so they are dangerous - they are hungry,” he said. “For all intents and purpose they could have been approaching these last few games with a must-win attitude because they were far behind and it’s probably similar this week - ‘we must win to get in the top six’. “Games are running out and they are still chasing, so it means for a dangerous team with nothing to lose. “So regardless of how the pattern of the game goes, at some point they will be throwing everything at us, and we have to be ready for that.